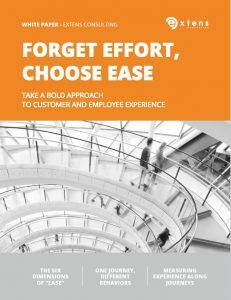 To become effective, “Ease” must be experienced by both Customer and Employee. Although it seems logical to render the customer journeys easy, we must be aware of the internal impacts. Thus, in all our missions, we make sure that the changes are simple to implement for employees, simplify their lives and increase their commitment to the company. Today, many companies measure customer effort with the Customer Effort Score (CES). At Extens Consulting, we have a different approach. We have chosen a positive way of measuring this by means of our indicator “Ease”. “Ease” is the combination of the easiness and ability to reach a goal without effort. We measure satisfaction (CSAT) and recommendation (NPS) with a positive approach. Measuring ease through the Customer Easy Score is a positive way to evaluate the customer effort. It should not be forgotten that the customer ease is directly linked to the employee ease, throughout all interactions. In general, only consumers take part in satisfaction surveys. 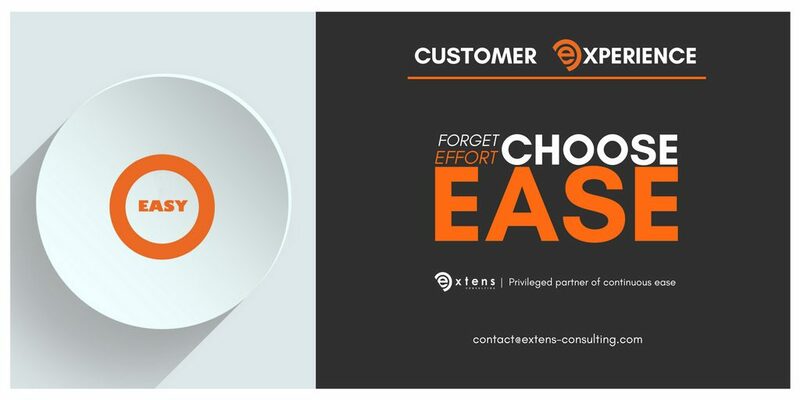 At Extens Consulting, we have decided to integrate employees and question them about their interactions and journeys with customers. That’s why we don’t simply talk about Customer Easy Score, but about “Customer Employee Easy Score” (C2ES), a new indicator that we’ve put in place.